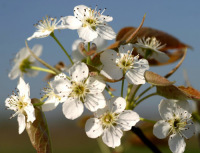 Nearly all European pear varieties are self-fertile but do better with a pollinizer. 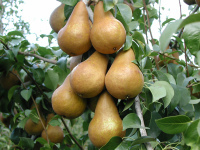 As most pears are diploids, they are suitable pollinizers for other varieties that bloom at the same time. 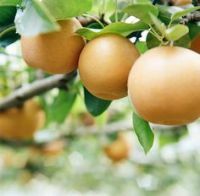 Domestic seedling, OHxF97 and Winter Nellis are used as the standard rootstocks and Quince and OHxF333 are used as dwarfing rootstocks. 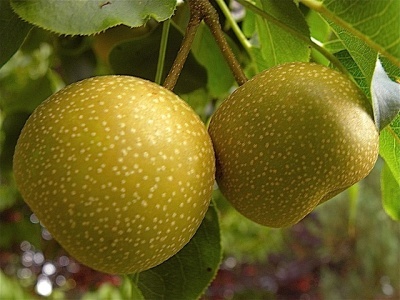 Hybrid pear varieties are self-fertile except Orient. Better yields will be realized for all varieties if another variety is present. Domestic seedling, OHxF97 and Winter Nellis are used as the standard rootstocks and Quince and OHxF333 are used as dwarfing rootstocks. Bartlett - The leading pear variety both commercially and for home use. It is an outstanding canning variety. Normally large, smooth, attractive fruit that is golden-yellow, slightly blushed with red. The flesh is tender and juicy, buttery and of excellent dessert quality. Trees bear young and have compact upright growth. Does not cross pollinize with Seckel. Ripens mid-July. 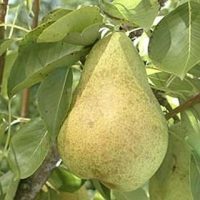 Bosc - This large, long-necked pear is yellow colored, marked with light brown russet. Bosc's very good quality and flavor make it an eating treat. A good quality market pear that ripens best at room temperature instead of cold storage. Ripens mid-September to early October. (Late/self-fertile). (image)​. Comice - An outstanding, large dessert pear. Late maturing with high quality, fine textured, juicy, sweet, melting flesh. Color is red, blushed golden-yellow. Low chilling requirement. A good eating pear, but best flavor after a month of storage. Ripens late September to mid-October. (Late/needs pollinizer). Red D'Anjou - A D'Anjou sport that comes on with a deep red surface that gets even brighter red after it comes out of storage and ripens. Flesh coloring, texture and flavor are identical to D'Anjou. Ripens mid-August to mid-September. Fanstil - Medium sized yellow fruit with red blush. Flesh is white, crisp and juicy. Low chilling requirement. Good resistance to fireblight. Florida Home - Very low chill, very heat and cold tolerant. Small, green fruit. Juicy fruit not too gritty. (Early/needs pollinizer). Flemish Beauty - Very hardy, large, productive tree. Medium size yellow flesh with red blush fruit. Very good flavor. (Early/self-fertile). Hood - large yellow-green fruit. Vigorous tree. Resistant to fireblight. Partially self-fertile, best with Floridahome. Very low chill, 100 hours. Kieffer - Medium to large fruit is yellow with a red blush. White flesh is crisp and coarse. Bears very late. Low chilling requirement. Excellent for cooking and canning. Stores well. Ripens early September to mid-October. (Late/self-fertile). Moonglow - Disease resistant Barlett-type pear. An excellent medium to low chill selection. Attractive fruit with soft red blush, best picked when green-yellow, then stored in a cool, dark place for one or more weeks. Excellent pollinator. Seckel - An outstanding, high-quality fruit. 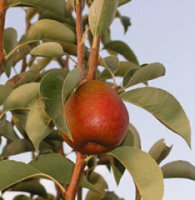 Fruit is small, reddish-brown over yellow with russet. Flesh is white and sweet. Excellent dessert pear. Low chilling requirement. Does not cross pollinize with Bartlett. Good resistance to fireblight. Ripens late August to mid-September. Winter Nellis - Medium fruit, yellow-green to green with russet. Vigorous and heavy cropping tree. Small sized tree. Ripens late September to mid-October. (Late/needs pollinizer). 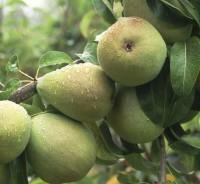 Asian pears are self-fertile, but yield will increase if there is another variety present. 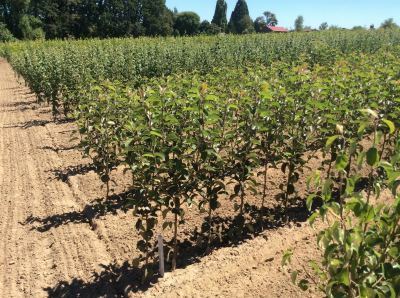 Domestic seedling, OHxF97 and Winter Nellis are used as the standard rootstocks and Quince and OHxF333 are used as dwarfing rootstocks. All Asian pears are noted for their crispness. Twentieth Century / Nijisseiki - This "pear-apple" combines the flavor and sweetness of a pear with the crispness and quality of an apple. These are best when tree ripened. Because they are so perfect for fruit salads, pear-apples are often called "salad-pears". Pollinize with Bartlett for best production. Ripens mid-August. (Mid-season/self-fertile). Chojuro - An oriental "pear-apple". Texture and firmness of an apple with an all-pear flavor. Excellent variety for home gardeners that are working with limited space. Fruit is oblong and lopsided. Skin is greenish-brown. Keeps well through February. Ripens mid-August. (Mid-season/self-fertile). Hosui - large juicy sweet fruit. Brownish-orange russet skin. One of the most flavorfull of the Asian pears. Early to mid-August, 400 hours. (image)​. Kikusui - Fruit medium to large, somewhat lopsided, yellowish-green. Flesh is sweet and mild, firm and juicy. Tree medium size, slightly drooping limbs and dense. Ripens mid-August. (Mid-season/self-fertile). Nitaka - Tree is medium in size. Fruit is round, skin is russet. Pear is sweet and somewhat coarse. Pollinizer is Bartlett. (Mid-season/needs pollinizer). Seigyoku - Skin is clear and glossy yellow. Average to large size fruit. (Early/needs pollinizer). Shinko - Bears early October in California. Excellent quality fruit, juicy, sweet flavorful and very crisp. (Late/needs pollinizer). Shinseiki - Fruit round to oblong, yellow with white flesh, crisp, and juicy. Tree is medium size and spreading, medium dense. Ripens late July to mid-August. (Early/self-fertile). Yali - Tree is large and very productive. Fruit is medium to large and pear-shaped. Skin color is green and smooth. Pear is mild and sweet. Pollinizers are Nijisseiki, Chojuro and Shinseiki.